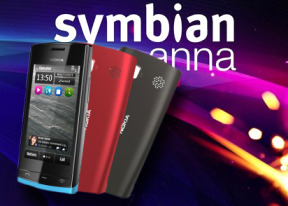 Symbian is still one of the most popular smartphone OSes in the world but its application store is pretty barren compared to the two juggernauts, the iOS App Store and Android's Market. The company has refreshed their Ovi store interface to make it more user-friendly for Symbian^3 and it's what you get on Anna too. And while the UI is indeed very handy to use, the number of apps is somewhat of a problem. The default screen shows a list of featured apps or you can browse the apps available in the Ovi Store by categories – Applications, Games, Audio and Video content, Personalization; or by collections – Summer Gift of Games, Chat Collection, Apps Start Kit, Travel, Tools for Professionals and Apps for Kids are the collections available at the time of this writing. Your account profile keeps record of all the apps you have installed under My stuff. You can now also select where games and apps should be installed and where audio and video should go. That’s nice – we wish Android had that right from the start. The Nokia 500 comes with a built-in GPS receiver, which managed to get a satellite lock from a cold start (A-GPS turned off) in about two minutes. Keeping the lock from then on was not an issue for the 500 even in a dense urban environment. As you probably know since the start of last year Nokia made their Ovi Maps navigation free for all their smartphones, which naturally includes the 500. The voice guidance is currently available in over 70 countries and over 40 different languages, with even traffic information for more than 10 of those. In addition, Nokia did a pretty decent job of the Ovi Maps application itself, blessing it with a cool, touch-friendly interface, as well as nice features such as the Lonely planet city guide, HRS hotels and the Michelin restaurant guide. There's also 5-day weather information for cities available along with Map Reporter, which can be used to report inaccuracies you find on the map. You can choose which of those are visible in the menu, which helps avoid clutter. With Ovi Maps 3.06 you get three different view modes including satellite and terrain maps. Those however do need an internet connection. The more regular 2D and 3D view modes are also at hand and can be used with preloaded maps. Starting with v3.06 can download maps directly from the phone, no computer needed anymore. The route planning algorithm is also rather easy to customize to best suit your preferences. Toll roads and motorways can be avoided and so can tunnels and ferries. Routes can be set to either fastest or shortest. Ovi Maps is also usable for pedestrian navigation or you can switch the GPS receiver off and use the phone as a hand-held map. Ovi Maps 3.06 also joins in on the location check-in craze and supports a long list of networks (but not Foursquare, understandably). Nokia 500 left us with mixed feelings. The spotty web browser and the poor camera performance left a bitter taste and we found it hard to describe the UI as fluid or responsive. In fact, more often than not it was downright laggy. We’ve seen this new 1GHz hardware platform do much better elsewhere so we are willing to blame it all on the non-optimized software that was rushed to the market. Of course that’s where we got our review unit – right off the store shelves. And we have to say, it performed worse than the pre-market sample we previewed earlier. Even the free lifetime turn-by-turn navigation and the brightly colored exchangeable rear covers didn’t make up for the poor impression. What’s more - the asking price of Nokia 500 doesn’t seem all that reasonable either. Currently, the Nokia 500 can be found for about 170-200 euros, the kind of money that will buy an Android smartphone like the latest Sony Ericsson Xperia mini and we are not even talking the X10 flavor. Putting the droids aside, Nokia's own C6-01 already runs Symbian Anna (and it’s prepping itself for a Belle upgrade). The C6-01 costs the same as the Nokia 500. It is based on a less capable hardware, but strangely, offers far better performance and comes with an AMOLED ClearBlack display with Gorilla glass. It offers goodies such as USB on-the-go and an 8 megapixel camera with a 720p camcorder. And it does have HD video playback,unlike the Nokia 500. Well, something went really wrong with the Nokia 500. It could be the software being a rather rushed job or it was done on purpose so they could keep it down in its market niche. Still, we’re willing to give it the benefit of the doubt and hope things will only get better for the Nokia 500 – both performance-wise and price-wise by the time the Belle update is released.